Heaven has muffaleta sandwiches that grow from trees and beignets that fall from the sky, right into your hands, ready to be dipped into flowing streams of freshly brewed coffee. Yes, heaven is a lot like New Orleans: expect the people to be friendly and the cocktails to be plentiful. Perhaps the only difference between the two destinations is that the afterlife requires a one-way ticket, and going to New Orleans is a round trip from which you will (hopefully) return home. And preferably, you’ll return home with only a small hangover and in pants that still fit after a week-long regimen of daiquiris and po’ boy sandwiches. This reality is especially vivid after a week spent in New Orleans during Tales of the Cocktail. Tales of the Cocktail is the spirits industry’s most important event. After attending the week’s series of booze-fueled “networking events,” it might take you a month at the gym without any cheat days to get your life back on track. Indeed, the half-naked revelers you’ll see on Bourbon Street, with their go-cups of Frozen Daiquiri permanently affixed to their hands, do not inspire many Aristotelian quotes about moderation. (Aristotle said that the enjoyment of pleasure is found somewhere in between the excess of intemperance and the deficiency of insensibility. Translation: know thy limits!) For the Bourbon Street stumblers, there is no tomorrow. For you, however, tomorrow holds professional development, seminars, meetings, and, in true moderation, a little bit of drinking from a go-cup at 4AM in front of the Old Absinthe House. Planning for balance and moderation at Tales of the Cocktail is difficult, but we are here to help. Here is our list of suggestions for places to eat, drink, exercise, and meditate during a steamy week in New Orleans for Tales of the Cocktail. It’s true: New Orleans is a city that can fry a thing, anything, better than any other city on the face of the planet. However, eating a leafy green from time to time may make you quite happy. The French Quarter’s closest fresh food hideaway is the popular Green Goddess. They offer standard, quality new-American dishes and sandwiches but most importantly, they often serve side salads instead of something like french fries—a mundane yet mature substitution that can go a long way. Green Goddess’s eponymously ethereal food and proximity to the Hotel Monteleone can create half-hour wait times, but the food is well worth it. Fresh food and tasty cocktails at Green Goddess. Photos courtesy of Green Goddess. Just four blocks west of the Quarter is the Brazilian gem, Carmo. “Carmo” might as well be Portuguese for, “avocado on everything,” and even though that might not be linguistically true, the logic still applies. 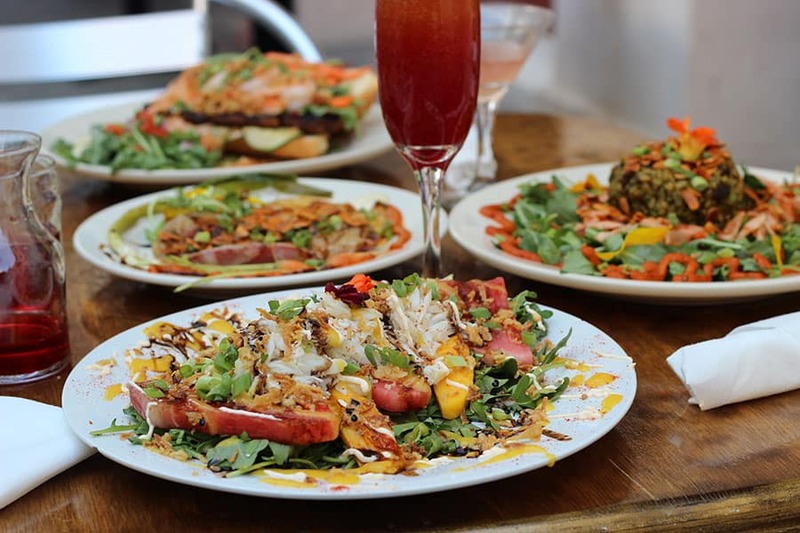 Carmo serves tropical-inspired cuisine and touts farm-to-table freshness, but more specifically, they have five different salads on their menu to prove it. 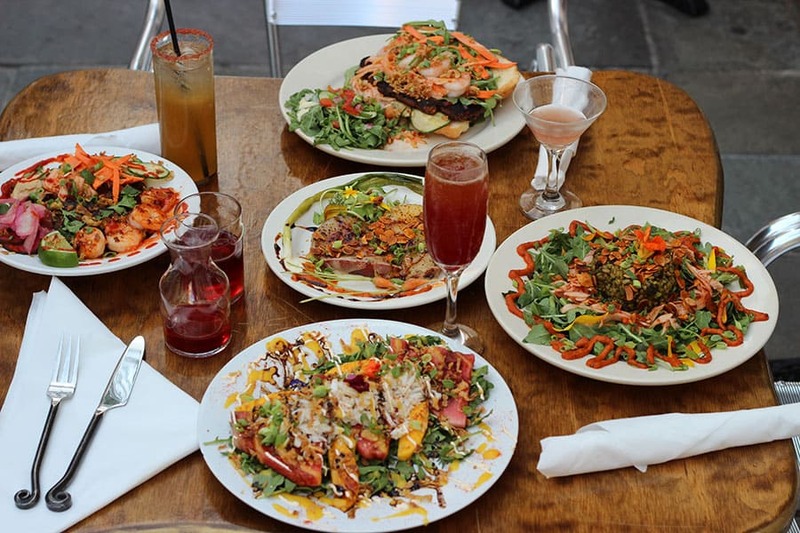 Down by Frenchman Street, on the other end of the French Quarter, is the humble Mona’s Café & Deli, a greatest hits restaurant for Middle Eastern cuisine. 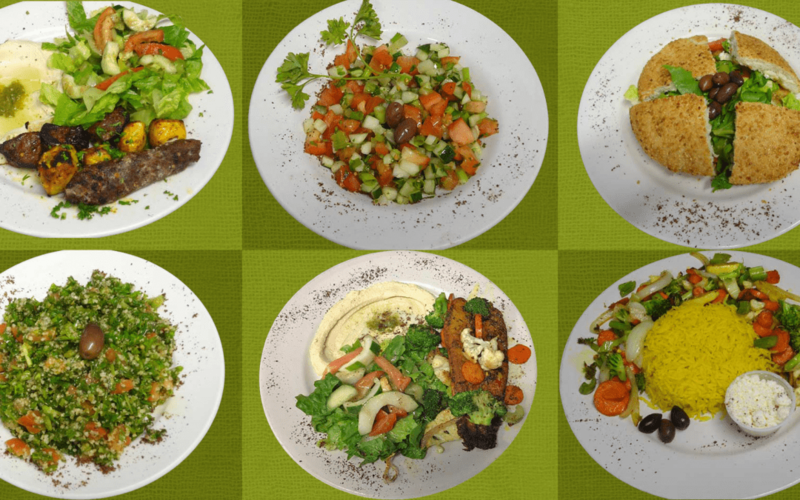 Whether it’s falafel, couscous or baba ganoush, they serve it fresh and often packaged to go for your hotel mini fridge. Look, we all love convenience store snacks, but it’s tastier and better for you to tuck into some late night tabouli instead falling asleep with your hand stuck in a Pringles can. Mona’s also has a small shop attached for your last-minute bitters or orange flower water needs. Don’t slack on your Ramos in NOLA. Although the French Quarter touts several “juice bars,” these daiquiri-stands-that-forgot-to-add-rum-to-their-blenders serve sugary tropical treats rather than healthy, fresh juices. If you are looking to drink your vegetables, you might need to travel a bit. The Garden district holds four proper juice bars (you know, the kind that serve green juices and sport a few decorative terrariums) that are just beyond walking distance but well within streetcar distance. Try having a touristy morning and take the legendary public transit to FARE Food for Health, The Pressery, Raw Republic, or Superfood Bar. You can even take it a step further as a “kale mule” and pick up a 6-pack of green juice and pass them out to your “green around the gills” friends. After all, kale is the Chartreuse of vegetables: an elixir for long life. Hot yoga, though not popular in New Orleans, is easy quite easy to practice in the Big Easy. Simply go outside—not in the shade—stand on one leg, and alternate. Namaste. In all seriousness, there are many yoga studios very close to the epicenter of Tales of the Cocktail that can help you regain your center. In the French Quarter you’ll find Reyn Studios, and you can visit Yoga Bywater in the neighborhood with the same name. Like yoga, running is an exercise for the traveler. Tales of the Cocktail in the French Quarter is flanked by two parks that are perfect for a revitalizing jog before the heat of the afternoon sets in. Louis Armstrong Park, to the northwest, has an inspiring cemetery to run past, shaded trees to run under, and lovely bridges to jog over. Woldenberg Park on the banks of the Mississippi has long, flat surfaces to run laps. Plus, you tell people later that you went running along the banks of the Mississippi. The Big Easy needn’t refer to one’s tummy when flying out of Louis Armstrong airport when your trip to Tales is over. And Tales of the Cocktail doesn’t force you to drink like a Don Draper on a bender. New Orleans has vegetables that aren’t fried, it has public places that don’t serve booze (but you can bring your own, wooooo! ), and spots where you can get hot and sweaty in a healthy way. But of course, we all need to find our own sense of balance in New Orleans. If you do, you’ll be well prepared to come back next year, ready for more.